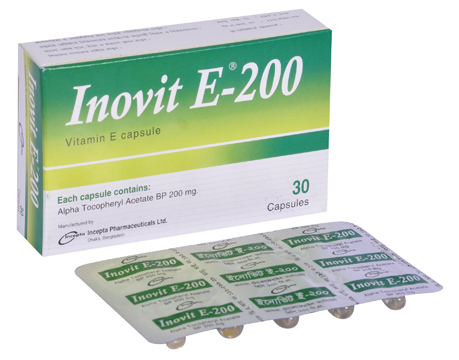 Inovit E 200: Each capsule contains Alpha Tocopheryl Acetate BP 200 mg.
Inovit E 400: Each capsule contains Alpha Tocopheryl Acetate BP 400 mg.
Vitamin E, a fat soluble vitamin, is considered an essential nutritional element. As an antioxidant, it protects polyunsaturated fatty acids in cell membranes and other cellular structures from free radicals and protects red blood cells against haemolysis. It may also act as a cofactor in some enzyme systems. Administration of vitamin E completely eliminates the signs of vitamin E deficiency. Vitamin E is absorbed from gastrointestinal tract and requires presence of bile salts, dietary fat and normal pancreatic function for efficient absorption. It is metabolized in liver and excreted primarily in bile. Small amounts are excreted in urine. In cardiovascular disease, haemolytic anaemia due to vitamin E deficiency, skin conditions, nocturnal leg cramps, sexual dysfunction, premenstrual syndrome and fibrocystic disease of the breast. 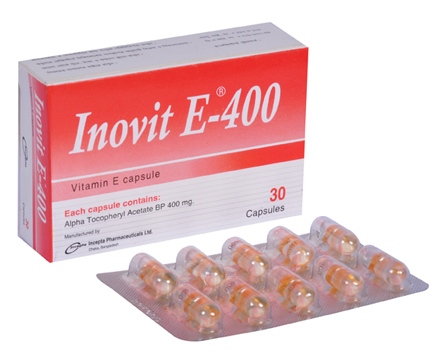 The daily intake of Inovit E (Vitamin E) in the range of 200 - 600 mg is considered safe. The recommended dose is one capsule once daily with or after meals or as prescribed by the physician. Vitamin E is usually well tolerated. Large doses (more than 400 mg/day) for prolonged period have been associated with a variety of less serious side effects including fatigue, weakness, headache, nausea, blurred vision, flatulence or diarrhoea. It may increase the risk of thrombosis in some patients, such as those taking estrogens. Pregnancy: Vitamin E may be used in pregnancy in the normally recommended dose but the safety of high dose therapy has not been established. Nursing Mother: Vitamin E is distributed in human breast milk; however, problems have not been documented with normally recommended dose.